Home > Neighbour Issues > What Constitutes Noise Pollution? Noise levels can be a real problem in any neighbourhood and there are many issues surrounding noise pollution in a residential area that are covered by Government Legislation. These include what you can and cannot do, what steps you could take to minimise the problems caused by potentially excessive noise, and what action could be taken against you if you don’t reduce your noise levels. In terms of the problems excessive noise can cause, most disagreements and arguments between neighbours can often be avoided if they are forewarned about potential ‘occasional’ situations which are likely to result in excessive noise. However, while excessive noise can be the result of a planned situation, sometimes it’s completely unplanned or somewhat out of your control. Even in these situations, there are still some precautionary measures you can take. Reasonable neighbours are not usually ‘killjoys’ and most of us will want to have a party celebration at some time or another. The best way of avoiding any problems with your neighbours is to tell them in advance that you are Planning A Party, what time it’s going to start and, more importantly, what time you’re planning to end it (or at least the time by which you’ll ensure that they won’t be disturbed by excessive noise – usually related to loud music but also by rowdy conversations and boisterous behaviour). In terms of the ending time, it’s not unreasonable to expect your neighbours to agree to a finishing time of the ‘noisy’ element to a party to, say, by 11pm or midnight. That’s not to say you can have the volume at whatever level you want, as there are strict laws surrounding that issue. Ending at midnight also doesn’t mean that the party can’t continue beyond that time, but you’ll need to keep the music and the noise down to a reasonable level so as not to disturb neighbours. You also need to take even greater care and be more sensitive to your neighbours if you’re planning on holding the party outside in the garden, where noise travels more easily and where its impact is felt even greater. Better still, why not invite the neighbours? 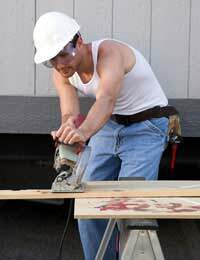 Once again, you should let your neighbours know that you are planning a DIY project where both manual and/or power equipment such as hammers and electric drills are being used. Everybody needs to do a bit of DIY now and then so they should be reasonable enough to understand. Agree working hours with your neighbours. You should be courteous enough not to begin any earlier than 8am and not to finish beyond 8pm. These are reasonable requests to make yet if your immediate neighbours have young children, you might wish to consider only carrying out DIY projects at weekends when the children are off school. Both burglar and car alarm systems can cause extreme noise pollution and can be one of the biggest causes of agitation among neighbours. Most modern alarm systems come fitted with cut off devices these days which silences the alarm after, perhaps, 20 minutes or so. Obviously, the problems caused by alarms going off usually arise when they are beyond your control. You’re likely to not even be at home to switch the alarm off manually, but there are still precautionary measures you can take, such as leaving a spare set of keys with trusted friends, family members or even other neighbours who can gain entry to a car or house and immobilise the device on your behalf. If you arrange for this, be sure to let your local council and local police station know the contact details for the people who have been entrusted with this task. Both the police and council do have the authority to immobilise alarm systems themselves by whatever means necessary, and this can incur extra expense to you. Incessant Dog Barking constitutes noise pollution and this is covered in more depth in another article contained on this website. Depending on the nature of the noise, the time of day it occurs and the circumstances surrounding it, if matters can’t be resolved and get out of hand, you should contact either the Environmental Health Department of your local authority or the police - in which case dial 101. You should not dial 999 unless it is an emergency. Your first port of call should be your neighbour, try to approach your neighbour in a calm manner in order to explain the issues you have. Don't try to raise your concerns while the noise is taking place as your more likely to be angry and more prone to arguing. If your neighbour is unwilling to compromise and the noise pollution continues you can take the matter further and contact your local authority, as they have a duty to take the matter seriously and investigate further, and if necessary take court action. You can submit a complaint to your local authority at www.gov.uk, where you will also find information about how to deal with noisy neighbours. For more information about the law on noise pollution in your area, you should check out your local authority’s website to ensure that you are complying with the law or you could face heavy penalties. I live in a detached house, and never had any problems with noisy neighbours, until about a year ago the neighbours on one side have abarking dashund dog, barking as and when, and waking me outside my bedroom window. I am 71 and was so looking forward to my retirement. I asked them could they keep the dog quieter...nothing, the council were involved....nothing. Then out of the blue they started slamming shut their external doors shut.I asked them could they plane them down if they were weather warped, again nothing. They say they are trying, and it goes quieter for a while, but then starts up again. On top of this there is a builder down the road, working on many houses for the last year, insists on his radio blaring out. I have just paid out thousands of pounds to have secondary glazing fitted, but the noise is so loud it comes right though the walls. I'm not anti social, and have lovedmy music all my life....but because of all this noise I now have to wear earplugs 24/7, no music ever, and am just a physical and mental mess, not living just existing. The council have told me there is nothing can be done. I have been off work ill for nearly 5 months. I know my neighbour has reported me for noise. She has a machine she switches on at the slightest noise . One of my medications can keep me awake at night and i am now too scared to put my tv on which i have on volume 1 ( so it is quite quiet) The trouble is the nieghbour sleeps downstairs in a room with a gas fire. She has had a man in her house since the beging of December 2018 and they sit talking or you can hear my neighbour getting irrate. In the middle of the night they have woke me up knocking on the wall between our ajoined houses . This morning around 5/6 o'clock my neighbours male friend chucked a can under my front window but i sat quite as i had all night just looking at fb. He then got hold of my flower basket under my front window and twanged it twice. I then heard my neighbour say is she a sleep. It was like they were trying to atagonise me into making noise or confronting them. I work for the council myself taking these type of calls . I am being quite at night and i might drop the odd thing by accident. I dare not even put my kettle on for a drink and to be honest I am feeling rather intimidated. Hi. My son plays the drums. He’s had a new kit for two weeks now. He plays for 15-20 mins 3 times a week. Never before 9am and never after 6.30 pm. My neighbours have reported us to the housing for constant banging of loud drums. We have been told by our housing we are in breach of out tenancy for anti social behaviour. Is this correct? We have silencer pads on the drums. They are not being play constantly at all. I do believe the neighbours record every time he plays. Are we being unreasonable at all? Our back garden joins the backgardens of a long row of terraced houses. I cannot clearly see these gardens due to trees and high bushes, so I cannot 'pin down' which house is responsible. But, for a few years now, this particular house has incorporated chime bells and coconut shells that constantly ring and bash together. It was awful in the summer, but now the winter weather is upon us, it is AWFUL! It must be affecting dozens of other homes that surround it. As I don't know which house it is, I don't know what I can do. I don't feel I have the sort of relationship with my fellow immediate neighbours to 'join' forces' as it were, as people keep themselves to themselves around here. Any advice would be much appreciated. Our neighbour is a DIY freak. At least once a month a new project takes place and I hear banging and sawing, drilling etc. Then in the evening they watch TV/movies/play music with a lot of bass. I work nights. I feel so exhausted I'm actually considering quitting my job. But I have financial commitments that would really make people suffer. I'm a light sleeper but I don't expect no noise at all. I'm perfectly fine with noise now and again, but the regular projects and loud bass at night/evening gives me no time to sleep. They only sleep when it's time for me to go to work, which I'm often late for now due to lack of sleep and being incredibly tired. I also feel I'm developing health problems at least in part due to this issue. They've lived in the house for almost 15 years, I don't know what he keeps working on. I believe he is a busy idiot but what can I do??? This is killing me and destroying my relationships. I have lived at my address for 30yrs. Never had problems with kids around here. Recentley a family with kids has moved in oppersite. Since then continual ball bouncing against a wall day an late eve early wkend mornings aswell its really like torture we have to shut our windows an door we dont sit in our garden any more because of it. Are we able to do anything. As its so irritating. There are two large parks nxt to were we live 2mins away. We have lived in our house for nearly 15 years and never had any problem with the neighbours. In the last two months they have put a radio in the garden on a timer that starts at 0730 and ends at 2130 every day whether they are there or not and the noise level is 45 dba when measured at my back door.In the recent good weather we've had it has meant that we couldn't have our windows or doors open. Is the window colour or anything related to appearance specified in the deeds? If not, there's not much you can do about that. The motorhome issue can be dealt with via the courts if it's a breach of covenant. Need Direction, Since last year our neighbors( tenants) constantly making knocking noises. No, it is not building work. Making ie, manufacturer the items. Contact local Council, not much help, while they are in our house, not much to hear. When noise comes, they say, itis not much to follow up. Need recording proofs. Contact Local Police, notice the noise but could not get access to neighbours to sort out when they do come back, no noise, no follow up. Contact Landlord denied accepting. They say, we have checked up, nothing there. No tools, no pieces of equipment. We are residence over 30 years, now as we getting older, our home should be relaxing place but opposite. Thanks, Wait to hear from all. Why not talk to the council (environmental health). Tell them your neighbours are complaining about the noise and that you don't feel you are unreasonably noisy and would like some advice. They should be able to tell you about times when you can create most/least noise and may be willing to assess the noise levels of TV etc. I also failed to say the council,architect or the landlord failed to mention work was being done on the house next door. They thru a large bit of plastic on our lean too.so we are not getting any light! I understand that people have to do things to improve their property but as we live in a terraced house their is no escape from the sounds. We might have to think about going away from Monday to Friday to escape the noise. As the next door neighbour we don't know our legal rights or what we can complain about as the law is so vague. I would have thought before work began that someone from the council before approving works determined how it effects neighbours. We are at number 5 and number 3 and 1 are both having extensive works being done. Also because we where told on the day works began it seems the landlord has a devil may care attitude! If there is damage caused by the builders,scaffolders etc where do we stand????? The council does not have to inform you if neighbours are about to start work. If planning permission is required, you may be consulted as a neighbour, but note that lots of work falls under the "permitted development" umbrella and does not need planning permission. If builders damage your property, talk to them and see if their insurance will cover it. If they refuse, you can use the legal system. Regarding working at a weekend /bank holiday, if this occurs often at unsociable times, contact your environmental health department. I also failed to say the council,architect or the landlord failed to mention work was being done on the house next door. They thru a large bit of plastic on our lean too.....so we are not getting any light! I understand that people have to do things to improve their property but as we live in a terraced house their is no escape from the sounds. We might have to think about going away from Monday to Friday to escape the noise. As the next door neighbour we don't know our legal rights or what we can complain about as the law is so vague. I would have thought before work began that someone from the council before approving works determined how it effects neighbours. We are at number 5 and number 3 and 1 are both having extensive works being done. Also because we where told on the day works began it seems the landlord has a devil may care attitude! If there is damage caused by the builders,scaffolders etc where do we stand????? We have builders next door to us,we where not told building work is being done whatsoever,! Anyway they have started work this am on a bank holiday are they allowed to work on a bank holiday? If they are behind in work can they work Sunday. Woke at 7.55 am this morning. I am recovering from a brain tumour and the noise is upsetting to me. My neighbours have started partying on a Saturday evening /night/early morning,it's 3.00 am and I can still here them singing in the house(with the patio door open) . My daughter works in retail and has to beup for 6.00 am to get to work.This is not the first time, last week was the sameand last year I had to speak to their visitors about playing football in the garden at midnight.Am I being unreasonable?I have been ill (2 strokes,due to stress at work ) and need to get proper sleep (they are aware that I am a stroke survivor ) . Can I complain to environmental health and get support ? We moved into a rented house five weeks ago and have had three complaints from the neighbors on one side there are five of us three children and a dog. They came round the day after we moved to complain about the dog barking and have also complained that my sons playing football in the garden and the ball has hit the fence the kids won’t go out there now and have complained about cupboards banging there are five of us and we are not overly noisy I’m not sure where to go from here. Talk to your landlord first of all...he/she may be willing to talk to the neighbours. To be honest the environmental health department will not take action in relation to children playing during the daytime. Your children should try and avoid hitting the fence with the ball of course. The best advice we can give is to simpy ignore it and to carry on as you are. Does your dog bark frequently? And do you stop it when it does? I live across from a Laurette. It use 2 be small and quiet. Now that it's extended with big pipes and a big metal tank. Its noisy all day, which I've had 2 get use to. It's evening till 7 morning you hear a vibrate sound.It driving me mad that I decided 2 look up sound/vibrate apps 2 record sound and it was reading 20-24 db from evening till next morning.I just want quietness. What can be done? Talk to your local environmental health officer and see if they can tell you if this is within acceptable levels. I live across from a Laurette. It use 2 be small and quiet. Now that it's extended withbig pipes and a big metal tank. Its noisy all day, which I've had 2 get use to. It's evening till 7 morning you hear a vibrate sound.It driving me madthat I decided 2 lookup sound/vibrate apps 2 record sound and it was reading 20-24 db from evening till next morning.I just want quietness. What can be done? My neighbour hates us for some reason but won’t say what it is. Ever time we play music they report us to our housing Association saying it’s disturbing them. If it’s inside it is disturbing and too loud and if it’s outside it’s too loud. Can I not play music? Is there a level? It’s always off by 8pm latest as we have small kids going to bed and we wouldn’t want to disrespect anyone. I live in terraced house so what can I do? She didn’t mind the music when we spoke but now gets mad. My neighbours have had a hate campaign against us for a bout 3 years now, we have been threatened, property damaged, we have 2 cars and park one on the drive but my Son parks on the road, they have a drive to the front and have 3 vehicles where they can park all outside their house, but one car always parks outside our house as close to our drive as possible as soon as my son has gone to work now the second car is out the front as soon as hes left, they also have now put up more cctv cameras, they now have 6 at the front of a semi and 5 at the back one now at the bottom of the garden near the boundary fence which appears to be looking into our garden and windows, they have previously had a drone going round our garden and looking in the windows, the parents went away over easter and their son played music as as loud as possible for 2 days the walls were shaking and they know we have a baby in the house we did knock on the door but as usual he didnt answer the door, weve tried talking to them but just get a mouthfull of abuse, I dread the summer as they have regular parties that go on till 4 am sometimes in the house where they bang on the walls and constantly shout, they have loud music in the garden then all their so called friends have to shout as they cant hear each other. My husband is retired and its getting us both down. There's also an issue of trespass if a drone comes into the airspace of your property (a civil action can be taken if this is the case). Talk to your council housing officer about this. It's not fair that your children should have to tip toe around but nor is a 1 bedroomed flat suitable for someone with two children.